There is no field where reducing weight enjoys a higher priority than in space flight. 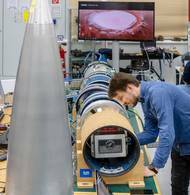 A team from the Technical University of Munich (TUM) has developed a payload module made of thermoplastic CFRP (carbon fiber-reinforced plastic) for the 23rd REXUS rocket mission. The payload module is 40 percent lighter than conventional aluminum modules. When the high-altitude research rocket of the German Aerospace Center (DLR) in early march takes off as part of the 23rd REXUS rocket mission, it will be carrying a special payload module: A team from the TUM Chair of Carbon Composites has developed a module made of thermoplastic carbon-fiber reinforced plastic. Compared to the aluminum modules used in the past, the newly developed payload module not only saves 40 percent in terms of weight, it also has specific advanta ges when it comes to manufacturing technologies: In contrast to fiber-reinforced thermosets, which are already used in aeronautics, the module does not have to cure at high temperatures in an autoclave after manufacture. This is the first module of its kind to be launched in a rocket. The payload module is essentially a cylindrical tube with load input rings integrated at the ends for screwing the individual modules together. Since the ring and cylinder are made of the same thermoplastic material, the reinforcement fibers can be bonded directly to the rings during the construction of the cylinder. "The magic words in the industry are 'in situ consolidation'. 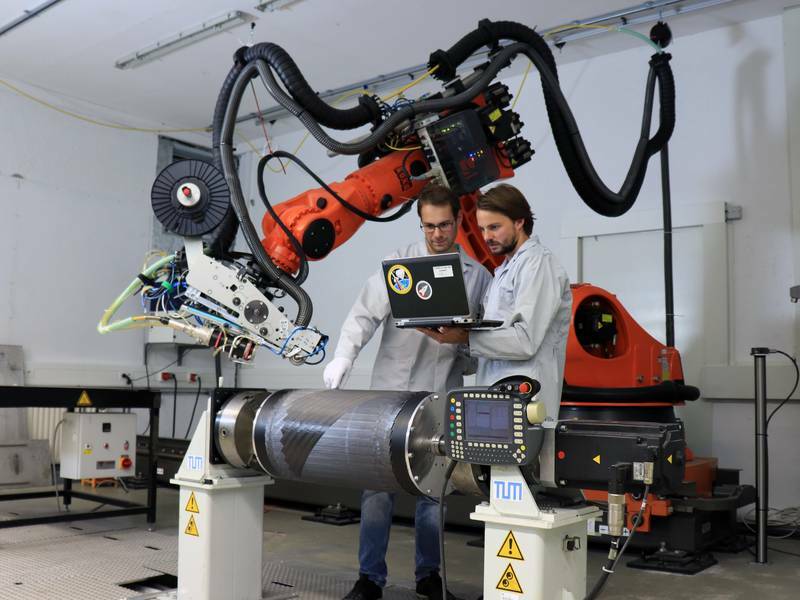 The consolidation process gives us a component that looks like it came from a single mold, with no adhesive joints or screw connections," explains Ralf Engelhardt, staff member at the Chair for Carbon Composites . "That saves time, weight and money." The fibers used in the construction of the cylinder are embedded in polyetheretherketone (PEEK). Wrapping and melting take place automatically: Sensors and their connections can be built directly into the material. Working together with the TUM Professorship for Measurement Systems and Sensor Technology, the team integrated fiber-optical temperature sensors read by a measuring device created by the TUM spin-off fos4X. During the flight they are thus able to directly measure the thermal load of the payload module at various depths within the material. "Since the optical fibers are very small, they only have a minimal impact on the module's mechanical properties," says Ralf Engelhardt. "Direct integration in the laminate during production creates many more possibilities as well: In addition to temperature monitoring, expansion measurements would also be conceivable. This would also enable real-time monitoring of the load the module is subjected to." To Prof. Klaus Drechsler, head of the Chair for Carbon Composites, the REXUS project clearly exemplifies how well the existing and future locations of the new TUM Department of Aerospace, Aeronautics and Geodesy. Thus for example the structural concept was created and the material characterization was conducted at the LCC in Garching. Production took place in the TUM "Processing Lab" at the Ludwig-Bölkow Campus in Taufkirchen/Ottobrunn. "The project gave the students a comprehensive look at all the aspects involved, from material sciences to process technology and structural mechanics, all the way to applications," says Drechsler. "At the new faculty we focus on this type of application-oriented and interdisciplinary education. In doing so we help secure the future of cutting-edge research in Bavaria while at the same time supporting the transfer to industrial application. In addition to the excellent infrastructure, the proximity and direct exchange with the aeronautics industry are of great value to us." The CFRP module with integrated sensors and measurements systems is a part of the REXUS Mission XXIII. 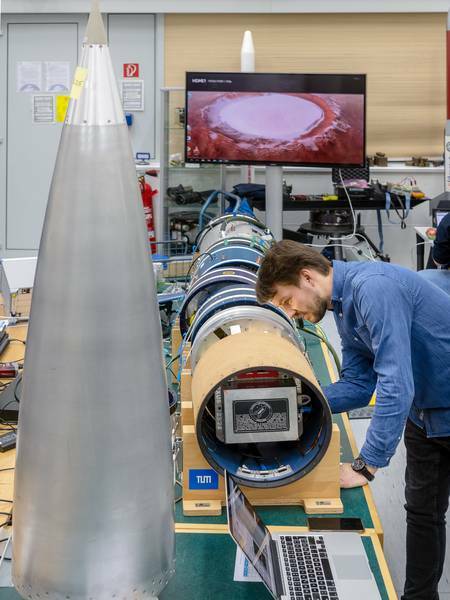 The REXUS program makes it possible for universities from throughout Europe to perform experiments on high-altitude research rockets in Kiruna, Sweden, and is operated under a bilateral agreement between DLR and the Swedish National Space Board. 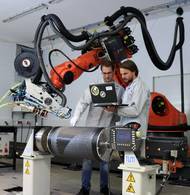 The tests on the module's qualification for the flight were conducted at the Center of Applied Space Technology and Microgravitation (ZARM), at the Bundeswehr University Munich's Institute for Lightweight Construction and at the DLR's Center for Lightweight Production Technology.